Cairn is a subscription service that delivers outdoor gear every month. They are inspired to enrich and expand the outdoor experience by fostering connections among those who create and enjoy it. Limited Time Deal: Use code HAMMOCK to get the Hammock Collection Box your first month! As always, this month’s box includes this Cairn Scout publication, which gives the lowdown on what’s in your box each month, as well as offering details on the monthly “Adventure Upgrade” prize, subscriber perks, and more. This Scout is focused on basic prep before setting off on an outdoor excursion. The Cairn blog expand upon the topic—see the post here! If you peeked at the basic preparedness blog post above, you’ll see a flashlight is high on the list. And, the one they recommend, the Coast HX5R, is the big ticket item included in this month’s subscription! I’ve never had a flashlight this nice, and I’m really amped about this rechargeable one because I have definitely tried to hold my phone in my mouth while searching through my pack out in the wild before, and it was…awful. As you can imagine! This flashlight comes with a wrist strap, a charged battery, and a USB charging cable. Everything is relatively lightweight, weighing in at 3.4 oz. If you’re counting ounces, you might be raising an eyebrow at me calling that “light” (I’ve seen tiny, 1-ish oz ones out there) but honestly based on its power, I think it’s worthwhile. Plus, if you’re not counting ounces, you’ll appreciate the extra heft to this still-compact tool. This flashlight features a two-way clip, a removable wrist strap, an LED light with two beamwidth options (a spotlight and a floodlight), impact resistance, water resistance, rechargeability with USB, AC, and DC compatibility. This is a really, really great item to have in your kit or car! Anyone who’s been camping—or even just stepped into their backyard to light up a fire pit—in Southwestern Pennsylvania is familiar with soggy firewood that just won’t cooperate. A couple of winters ago I received wax-coated sticks as a gift and they really worked wonders to keep things warm while my logs caught. These are even better because they’re lightweight and don’t take up much space! I didn’t get the chance to put these fire starters to the test with swampy logs because it’s the middle of a wet winter here and we’re sticking to fireplace fires for now, but I struck one just to test it out and was pleased to find it lit easily and burned slowly—the 7 minutes suggested on the box seems accurate. Another great tool! This month’s trail fuel (a different type of fuel!) is organic, gluten-free, and vegan. Score! It doesn’t have as much protein as I’d like (4g) for how much sugar it has (19g) but at least it’s all natural and really tasty. The consistency is a little gummy, like dried fruit. Super good! Verdict: Cairn‘s February box gets two thumbs up! I was provided with two incredible additions to my pack and introduced to a new brand of bar that was really delicious. This box costs $29.95, which includes free shipping, and the contents add up to an estimated $45.37, which is a good deal. Can you still get this box if you sign up today? Based on their subscription model, your items may vary based on your survey responses and boxes you have received in the past. Coupon – Use code TRAILHEAD to get the Trailhead welcome box your first month! Check out our review of the Trailhead Welcome Box to see what will be included. Check out all of our Cairn reviews and the Lifestyle Subscription Box Directory! What do you think of Cairn this month? Did you get the same items? 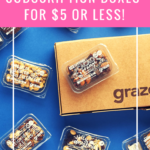 Christen stepped into the world of subscription boxes by signing up for Graze. After her world was changed (for the better, obviously) by a steady delivery of amazing snacks, she realized she needed to expand her horizons to include deliveries of eco-friendly products, clothes, and beyond. How do subscribers rate Cairn? Do you subscribe to Cairn? Add your rating now! That’s what I think, too! I might not have spent $40 on a flashlight for myself, but now that I have one, I know I’ll use it often.